As we have previously highlighted (see links here, here, and here especially) the Epsom & St Helier Trust has produced a document they call their "Estates Review". The document is riddled with contradictions, some of which we will go into elsewhere. It appears to have been drafted to give the impression of a hospital trust whose buildings are not fit for purpose - presumably to justify the closure or demolition of our local hospitals. The general argument of the document, and the general flavour of what the Trust seem to be arguing at the moment gives the impression that the buildings at Epsom and St Helier hospitals (and Queen Mary's Hospital for children) are now so old, that it is no longer possible to use them. While there are of course cases in life where a building can get so old, that maintenance costs more than it would cost to knock it down and start again, we have so far seen precisely zero evidence to back up this claim in the case of Epsom & St Helier hospital. First, let's take at the history of St Helier hospital. 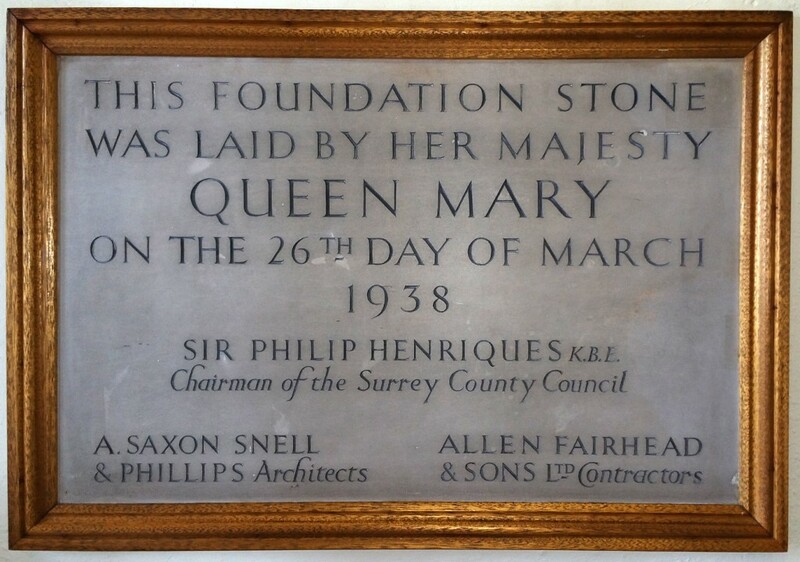 In 1936 Surrey County Council acquired a 999-year lease on a 10-acre plot within the St Helier Estate on which to build a hospital to serve the local area. The cost of the ground rent of the plot was £1 a year. On the 26th of March, 1938 Queen Mary laid the foundation stone for the new hospital, which was to be completed by 1940. 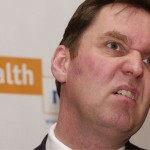 The projected cost of the hospital was £990,837. The new hospital would be built in the art-deco style, have 862 beds and an Out-Patients Department, which would include clinics for patients with Tuberculosis, "VD" and mental health complaints. There would also be a dental surgery and a Pathological Laboratory. The X-ray and Massage Departments would serve both inpatients and outpatients. 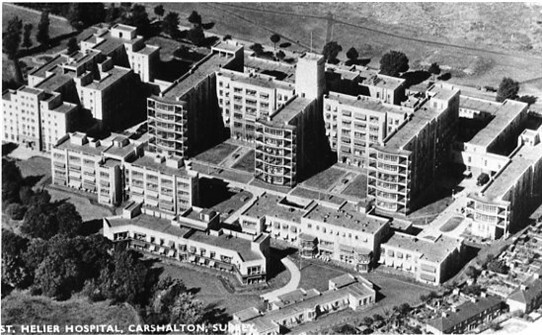 St Helier Hospital opened on the 24th of February, 1941. This is when the first patients were admitted. Although the building had been completed by 1940, because of WWII it could not be properly equipped because of shortages of staff and materials. As the building stands near the top of a hill, and lies near to London, there was concern that the Luftwaffe may use the building as a landmark while en-route to London, so the buildings had been camouflaged by being painted dark grey to make them less visible from the air. 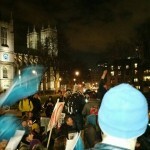 The building was designed by architects Saxon Snell & Phillips. They were chosen for their experience in hospital design. In the main hospital the wards were long with beds down each side and a window between each bed. There were also side wards at one end and a solarium at the other. As we can see, the original design was well thought out, built to last, yet care was still taken to make the building elegant. And unlike other municipal buildings, such as schools, there is never any chance to close the building to the public to more easily perform maintenance. It has been there, whenever the local people have needed it, almost every day since it opened in February 1941. The Empire State building in Manhattan, New York, was completed in April 1931 - a full ten years prior to St Helier Hospital. 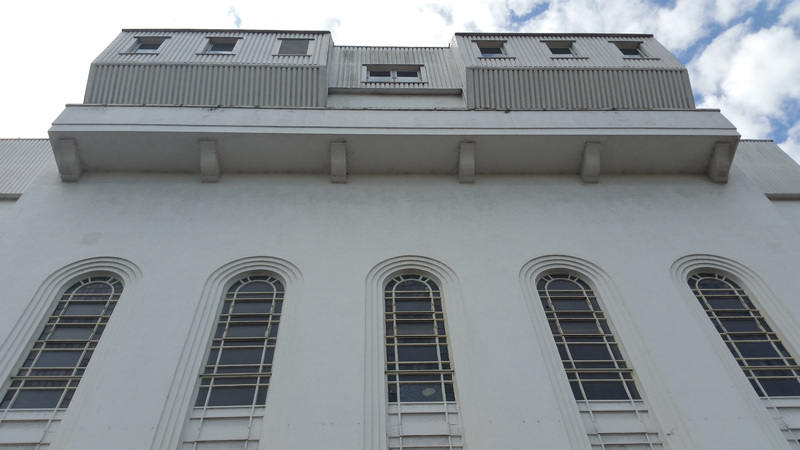 It too was built in the art-deco style, but in some ways has a shared characteristic of being functional, yet elegant. 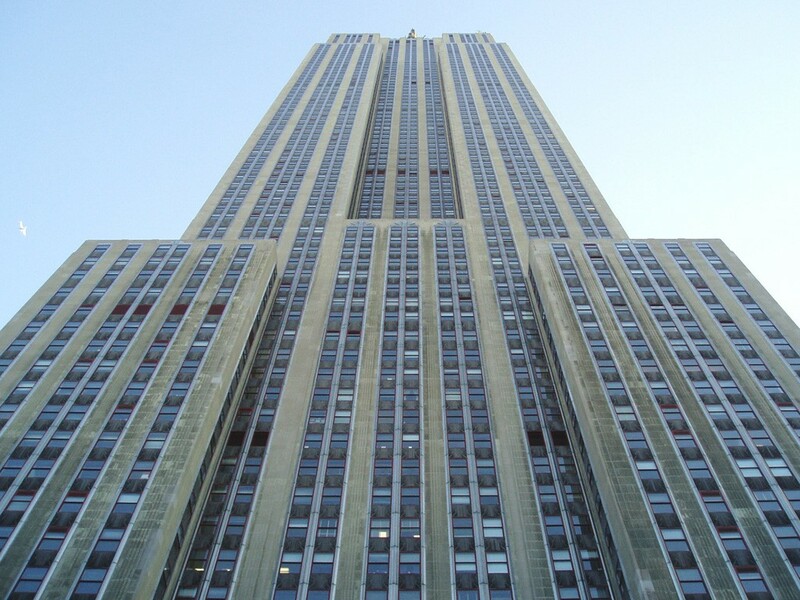 The Empire State Building cost $40,948,900 to build. Long-term forecasting of the life cycle of the structure was implemented at the design phase to ensure that the building's future intended uses were not restricted by the requirements of previous generations. This is particularly evident in the over-design of the building's electrical system. The building's art-deco design is typical of pre–World War II architecture in New York. The modernistic stainless steel canopies of the entrances on 33rd and 34th Streets lead to two story-high corridors around the elevator core, crossed by stainless steel and glass-enclosed bridges at the second-floor level. The lift core contains 67 elevators. There are absolutely no plans to demolish the Empire State building, despite being a full 10 years older than St Helier. Michelin House was built to be the headquarters of the Michelin Tyre Company plus a tyre fitting workshop and warehouse, and opened for business on the 20th of January 1911, making it almost exactly 30 years older than St Helier Hospital. It is hard to define the architectural style of Michelin House. 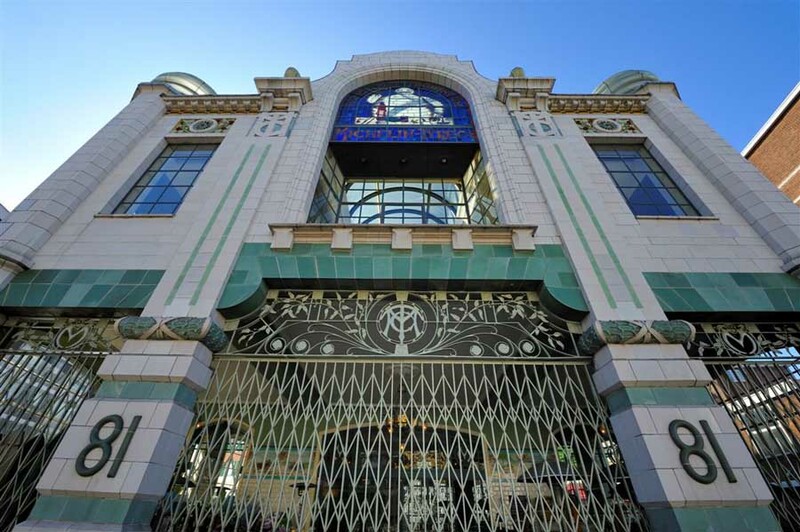 It was designed and built at the end of the Art-Nouveau period. Parts of this style can be seen in the decorative metal work at the front of the building above the fitting bays, and the tangling plants around the tyre motifs at the front, and at the side of the building, and also in the mosaic in the entrance hall. Despite this, Michelin House is very much like an Art-Deco building. In this respect, Michelin House is a building twenty years before its time. Oxgangs primary school was build in 2006 as part of a wider programme that saw 17 schools built or refurbished following a £360m deal between the council and a private finance consortium under the Public Private Partnership 1 (PPP1) scheme. 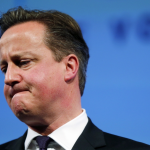 For reference PPP schemes are very similar to the widely discredited PFI schemes which are currently crippling NHS trusts with debt all over the country. 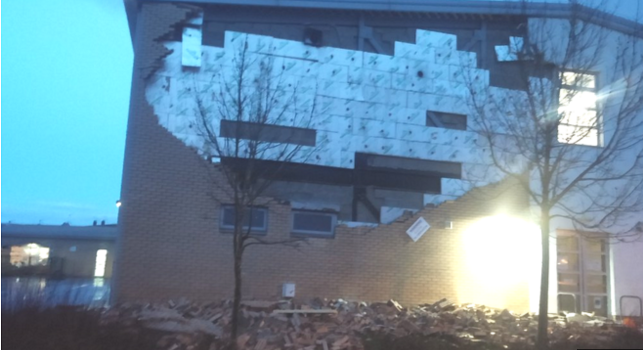 In January 2016, high winds caused a section of wall at the school to collapse, requiring urgent repairs to be carried out. The school reopened after a few days, but In March 2016 an inspection revealed serious concerns about the way the external wall had been constructed when the school was built 10 years ago. Days later, a further three schools - St Peter's RC Primary, Firrhill High and Braidburn Special Schools - were also closed after being deemed to be unsafe for pupils. The schools had all been built by Miller Construction, which was acquired by Galliford Try in 2014, under the PPP1 project. 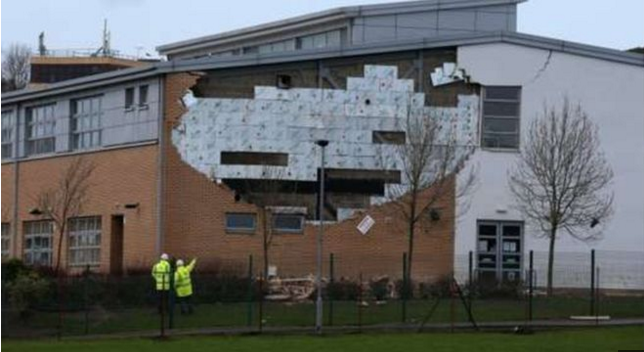 It had been hoped the schools would reopen after the Easter holiday - but structural engineers found "further serious defects", including an absence of tie-bars attaching the outer skin of the wall to the fabric of the building, during remedial work at Oxgangs Primary on Friday 8 April. Apparently, there are no plans to demolish any of the PPP1 funded schools, build only 10 years ago. Surely the Epsom & St Helier Trust are not suggesting that St Helier Hospital is too old to be properly maintained, and arguing that a new-build "centre", as per the Trust's stated "Aspiration" in this article would somehow be better? We are also still no closer to understanding how any such project might be funded.